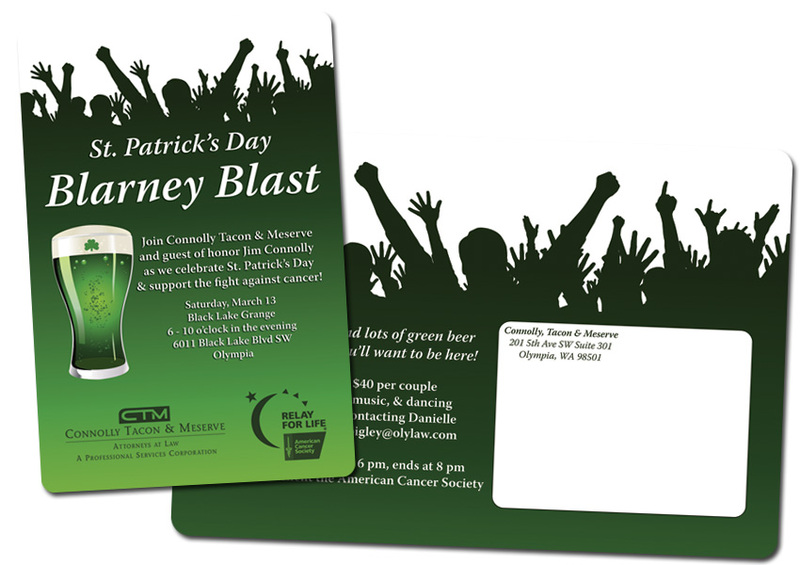 We're in the crazy last few days before the 2011 Blarney Blast...and I realized that I never blogged the design pieces from the 2010 Blast! 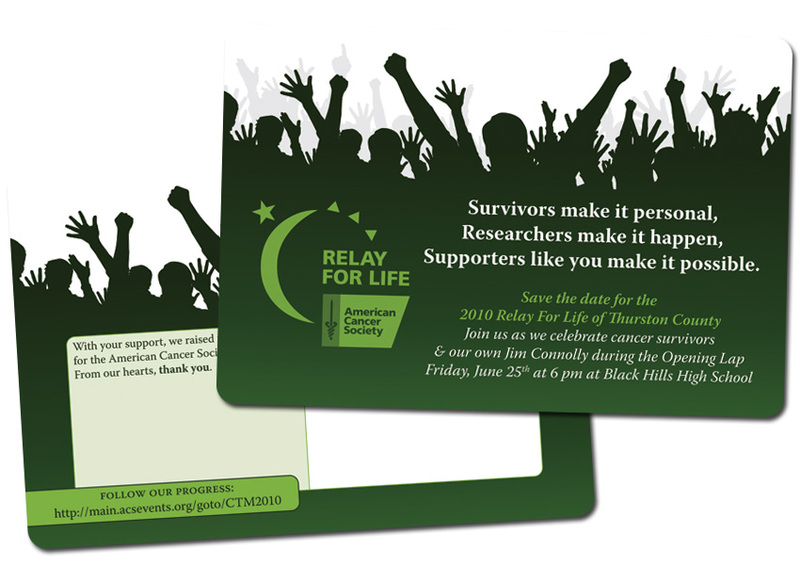 Finian Road has always been an avid supporter of the American Cancer Society, so being able to design the printed pieces for a fundraising celebration is always a treat! Last year, our Relay For Life team wanted to have a fun gathering where we could celebrate one of the partners of the firm, Jim Connolly, who had been diagnosed with kidney cancer a few months earlier. Combining his Irish heritage + Relay, and the Blarney Blast was born. The two main printed pieces -- the invite and the thank you -- were designed by Finian Road. Both were postcards with rounded corners. Keeping the size at 4x6 allowed for lower postage rates. We tied in both the corporate logo + the Relay logo into the colors of the invite, and kept the design festive + simple. After the event itself was an enormous success, we wanted to not only thank those who supported the Blast, but then invite them to the Relay For Life as well. On the 'thank you', we included two specific things: a 'save the date' for the Relay (with date/time) and the link to our fundraising site so our supporters could follow our progress. We wanted to make sure that our supporters had the Relay's date on their calendars. We designed a "Connolly's Crew" lap that followed the Opening Lap for cancer survivors, and it was one of those poignant times where you were tearing up at the same time you were cheering. Some of my favorite event photos -- ever -- are from the Connolly's Crew lap, where Jim was surrounded with all of his friends and family. As we are approach the 2011 Blarney Blast this weekend, we will be fighting back in his memory. I'll highlight this year's event + goodies next week, after the Blast!